There are tons of apps out there for assistance with traveling on the open road. We have chosen these 5 apps as our favorite for RVers. 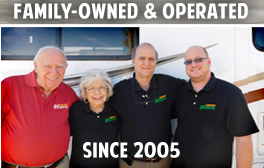 Sanidumps RV Dump Station Locator: Waste tanks full but you do not know where to go to evacuate them? This app directs you to the nearest dump station, making waste management simple and efficient. You can search by GPS or enter the city and/or zip code. Free on Google Play or iTunes. Walmart Parking App: Many Walmart locations across the country allow RVers to park overnight at their stores, something many of our RV renters take advantage of when they are in between destinations. The app will let you know where every Walmart on your route is and whether or not they allow overnight parking. It also provides you with the address and phone number of the store. Free on Google Play/$2.99 on iTunes. Gas Buddy: Find the cheapest gas prices in your area with the free Gas Buddy app. Reserve America: Search for campgrounds, check availability, read reviews, look at photos, research amenities and even book your RV site with this great app. OhRanger: If you are looking for local, state or federal parks along your route, OhRanger is the app to download. You can search for places nearby or at your destination and find those that have campgrounds. If you have a favorite Smart Phone App that you like to use while you are RVing, please let us know. Send us an email to reservations@suncoastrvrental.com.